Lime green, Yellow, White and Black. All I could see in this color combination was a graphic black and white pattern. I went from there. You can see all the glorious details in the video below! Have a totally fab idea to use these colors? 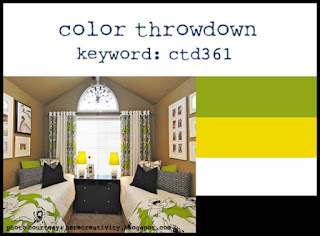 You can play along at the Color Throwdown Blog. Need even more color inspiration? Fabulous layout - the popped up tag is so clever! And your floral arrangement is gorgeous - thanks for the video! Beautiful card Kelly, wonderful colour combo. Off to experiment. This is a fabulous design! Great use of the colours and I love how your tag fades into the background! Gorgeous. Looking forward to watching the video later. Love that bit of splatter on the stenciled design. At first I thought the tag was clear...very clever. Oh how STUNNING!! I LOVE the black and white with the big yellow flowers and green leaves. Wow, wow, wow!! Oh I love that so much! The big yellow blooms are gorgeous and the neutral background is just perfect. So inspirational! Your card is gorgeous! You really rocked the color challenge. Love your use of the colours Kelly! Stunning card. I love your card and especially the way you've faded it off the page with your photo!! Super job!! Stunning card!! Love the tiny pop of color against the graphic background!